The inner form of the Tree of Life consists of two sets of seven regular polygons, one set being the mirror image of the other. The polygon in either set that has the most corners is the dodecagon. As it is the tenth type of polygon, three types of polygons are absent from the inner Tree of Life. Previous articles have shown that its seven types of polygons encode information about how this blueprint manifests in holistic systems. If they formally correspond to the seven Sephiroth of Construction, this suggests that the three absent polygons may correspond to the three members of the Supernal Triad, so that the first 10 regular polygons correspond to the 10 Sephiroth. This article uncovers amazing evidence of design, i.e., conceptual coherence, rather than unconnected disorder, that supports this conjecture. Data is provided in the form of the geometrical and yod compositions of the first ten regular polygons. They are found to embody the fine-structure number 137, the superstring structural parameters 168 & 840 and the dimension 496 of the two superstring gauge symmetry groups SO(32) & E8×E8. the seven types of polygons making up the inner Tree of Life → seven Sephiroth of Construction, which express the objective, 7-fold aspect of God and which manifest in His Creation. Figure 1. The first (10+10) enfolded polygons. 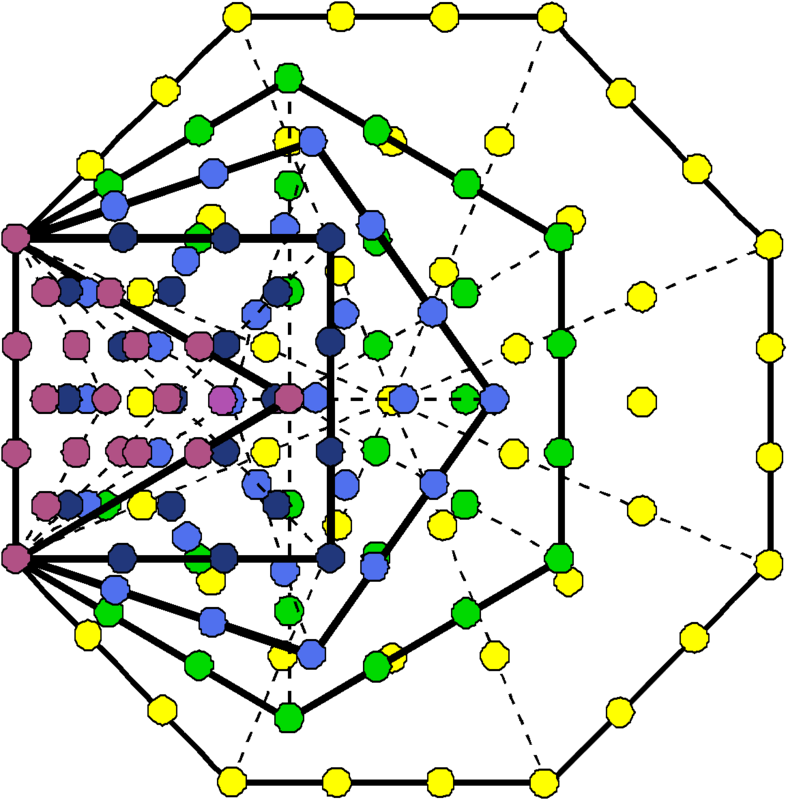 Despite the fact that the geometry of overlapping circles that generates the inner Tree of Life (see here) does not create three of the first 10 regular polygons, these absent polygons, being analogous to the archetypal Supernal Triad as the source of all levels of existence, might be expected to have properties that are analogous to those found in the seven types of polygons, if this analogy between Sephiroth and polygons really holds. Let us now investigate whether this is true. Figure 2. 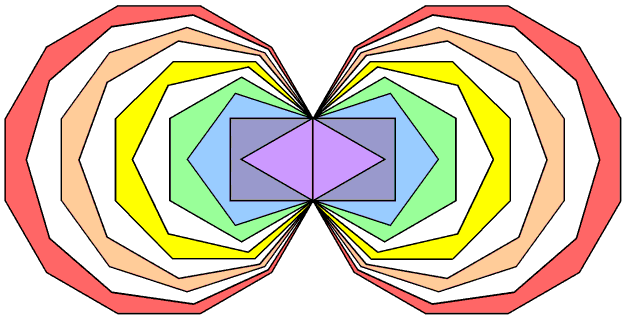 The 2nd-order tetractys character of the first 10 separate polygons. 1 + 2 + 3 + 4 + 5 + 6 + 7 + 8 + 9 + 10 = 55. Sephiroth of Construction: Chesed-Geburah-Tiphareth & Netzach-Hod-Yesod (Fig. 3). The 10 separate polygons have (27+48=75) sectors with (30+55=85) corners. This is the number of yods making up the 10 tetractyses in a 2nd-order tetractys. Moreover, the tetractyses at its three corners contain 30 yods, the seven other tetractyses containing 55 yods. The former are analogous to the 30 corners of the 27 sectors of the three absent polygons and the latter are analogous to the 55 corners of the 48 sectors of the seven polygons in the inner Tree of Life. Figure 3. The two triads of Sephiroth of Construction. The white centres of the three corner tetractyses correspond to the centres of the three absent polygons, their 27 blue yods correspond to the 27 corners of the latter, the seven black centres of the seven coloured tetractyses correspond to the centres of the seven polygons and their 48 red yods correspond to the 48 corners of these polygons (the six red corners of tetractyses correspond to the six corners of the hexagon and the 42 red hexagonal yods correspond to the 42 corners of the six other polygons). We see from these detailed correspondences that the 2nd-order tetractys symbolizes the first 10 polygons, with that part of it corresponding to the Supernal Triad symbolizing the three absent polygons and that part corresponding to the seven Sephiroth of Construction symbolizing the seven types of polygons in the inner Tree of Life. 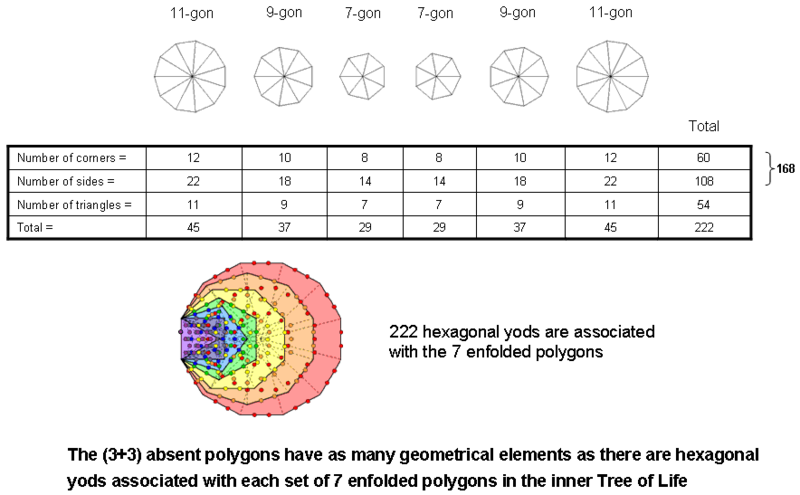 Here is mathematical confirmation that an analogy between the 10 Sephiroth of the Tree of Life and the first 10 types of polygons does, indeed, exist; there are far too many correspondences to be attributable, plausibly, to chance. Table 1. Geometrical composition of the 3, 7 & first 10 polygons. 1. The Godname EL of Chesed with number value 31 prescribes the geometrical composition of the 10 separate polygons because they have 310 (=31×10) corners, sides & triangles. Both sets of 10 separate polygons have 620 geometrical elements. 620 is the number of Kether ("Crown") (Fig. 4). Figure 5. The 74 sectors of the first 10 enfolded polygons. ADONAI prescribes the lowest 10 overlapping Trees of Life because they have 65 SLs (see here), so it is highly appropriate that it should determine the geometrical form of the first 10 enfolded polygons. They also have 65 sides outside their shared side. Both sets of 10 enfolded polygons have (65+1+65 =131) sides, where 131 is the number value of Samael, the Archangel of Geburah. 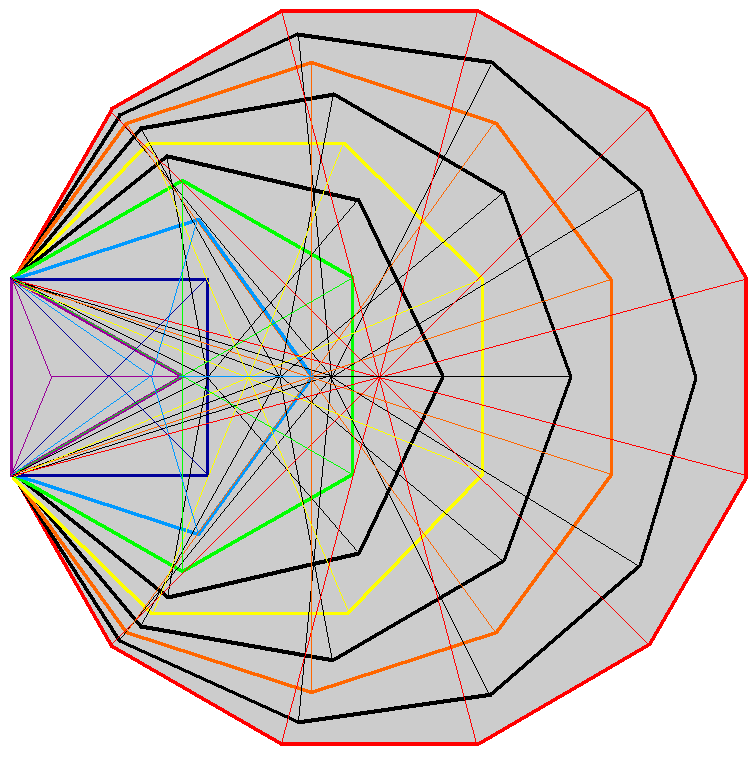 The sectors of the 10 enfolded polygons have 139 sides. Remarkably, this is the number of yods in the first five enfolded polygons of the inner Tree of Life (Fig. 6). of the inner Tree of Life have 139 yods. corners of internal triangles creating edges of the two polyhedra in the Polyhedral Tree of Life. (coloured red) arranged on the three sloping edges of the tetrahedral array of 20 integers (Fig. 7). (Integers at centres of faces are omitted for the sake of clarity). 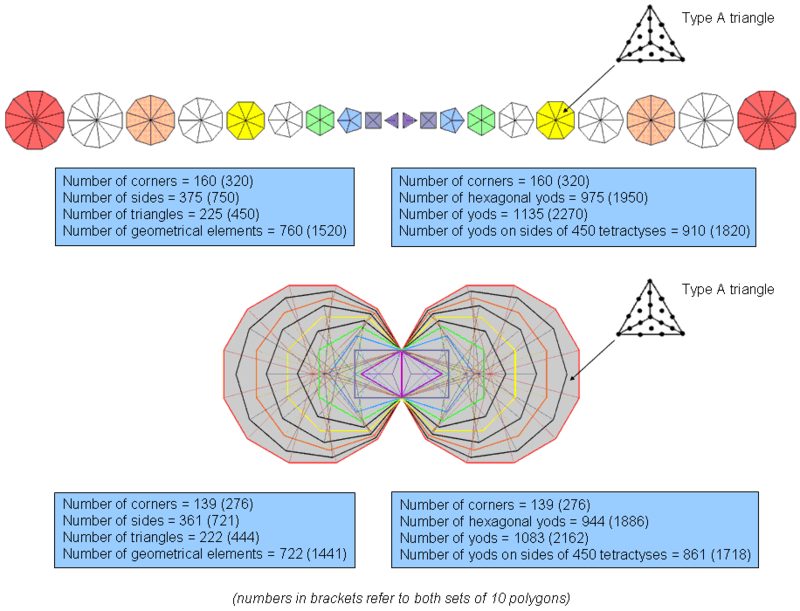 If the vertices of the two polyhedra making up the Polyhedral Tree of Life are joined to their centres, their resulting 396 internal triangles have 138 corners. Two sides of each hexagon in the inner Tree of Life are sides of triangles in the outer Tree of Life, forming their side pillars, so that the first 10 enfolded polygons have 74 sectors with 137 sides that are intrinsic to them. Here is another way in which they embody the fine-structure number 137. 5. The (3+3) separate, absent polygons have 222 geometrical elements. This is the number of hexagonal yods associated with each set of seven enfolded polygons when their 47 sectors are tetractyses (Fig. 9). Figure 9. The (3+3) absent polygons have as many geometrical elements as there are hexagonal yods associated with each set of 7 enfolded polygons in the inner Tree of Life. (See also #12). It is also the number of permutations of the rows of yods in the three orientations of a tetractys (see here). Notice that each orientation generates 74 permutations of the three rows of yods, where 74 is the number of sectors of the 10 enfolded polygons. This is also the number of vertices in the "144 Polyhedron" (see second diagram in comment (3)). See Article 50 (Part 1) & Article 50 (Part 2) for how Fibonacci numbers manifest in various sacred geometries. Table 2. Yod populations of the 3, 7 & first 10 polygons. is the number value of Ashim, the Order of Angels assigned to Malkuth. This shows in a very direct, unmistakable way how YAHWEH, the Godname of Chokmah with number value 26, prescribes the hexagonal yod population of the 10 enfolded polygons. It also prescribes the 26 corners of the three enfolded, absent polygons. Indeed, there are 73 yods on their sides, where 73 is the number of Chokmah (Fig. 10). This is the number of yods in the 12 tetractyses needed to construct the Star of David (Fig. Figure 11. 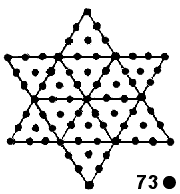 The Star of David representation of the number 73 of Chokmah (“Wisdom”). Figure 12. 350 hexagonal yods line the (47+47) tetractyses in the (7+7) enfolded polygons. 385 = 12 + 22 + 32 + 42 + 52 + 62 + 72 + 82 + 92 + 102. Figure 13. 385 yods line the 75 sectors of the first 10 separate, regular polygons. 165 = 12 + 32 + 52 + 72 + 92. The three enfolded, absent polygons contain 157 yods, i.e., 153 yods outside their shared side, where 153 is the number value of ELOHIM SABAOTH, the Godname of Hod. The (3+3) enfolded, absent polygons contain 310 (=31×10) yods, where 31 is the number value of EL, the Godname of Chesed. How appropriate that this Godname, which translates as "God," prescribes the yod population of those polygons which correspond to the Supernal Triad, the triple Godhead! How also appropriate that 155 yods are associated with each set of three polygons, for 155 is the number value of ADONAI MELEKH, the complete Godname of Malkuth! This number, truly, quantifies the form of the three absent polygons. Its geometrical representation is discussed here. Figure 14. Properties of the first (10+10) Type B polygons. Table 3. 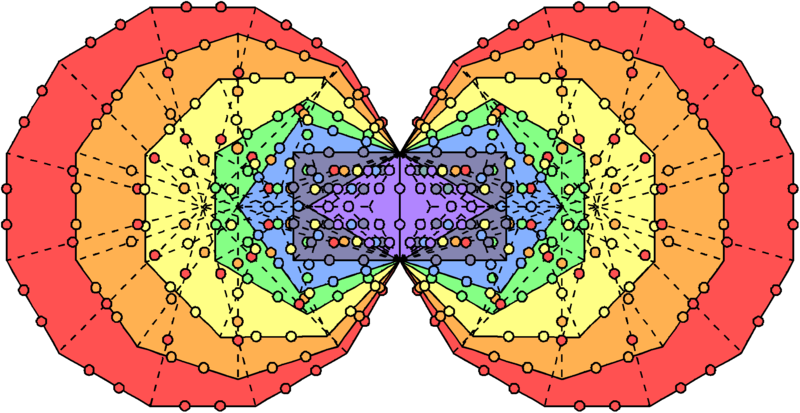 Geometrical composition of the 3, 7 & first 10 Type B polygons. Figure 15. 137 corners are intrinsic to each set of 10 enfolded polygons. 137 is the 33rd prime number, where 33 = 1! + 21 + 3! + 4!. 5. As the three enfolded polygons have 26 corners, there are (500−26=474) corners & sides other than these in the 10 enfolded polygons. 474 is the number of Daath (“knowledge”). Table 4. Yod populations of the 3, 7 & first 10 polygons. Figure 16. The first 10 enfolded Type B polygons embody the holistic parameter 85.
symbolize the 840 turns in the outer & inner halves of each whorl of the UPA/subquark superstring. 1886 hexagonal yods = 206 hexagonal yods + 1680 hexagonal yods. Figure 18. The analogy between the human skeleton, the superstring whorl and the 3:7 distinction between the first (10+10) enfolded Type B polygons. 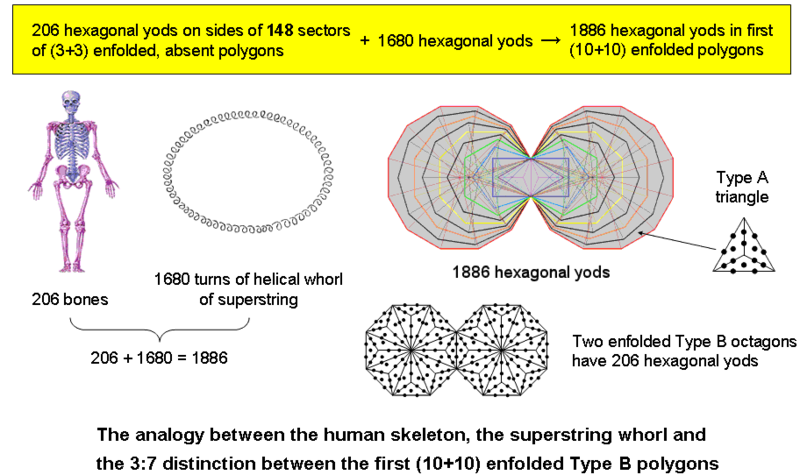 (3+3) enfolded Type A polygons absent from the inner Tree of Life and 1680 hexagonal yods added by the conversion of the (10+10) enfolded polygons into Type B polygons (Fig. 18). The division stems from the basic distinction between the Supernal Triad (the triple Godhead) and the seven Sephiroth of Construction. What is remarkable is that the primary, structural parameters of the human body and the whorl should add up to the number of hexagonal yods in the (10+10) enfolded polygons! Holistic parameters can be composed of several other holistic parameters, each having its own context that is not necessarily connected to one another. The number 206 is also embodied in the two enfolded, Type B octagons because they contain 206 hexagonal yods. This means that the other (9+9) enfolded polygons contain 1680 hexagonal yods, each set of nine polygons having 840 hexagonal yods outside their shared, root edge. As a Type A octagon contains 49 yods (see here), EL ChAI, the Godname of Yesod with number value 49, can be said to prescribe the number of circularly polarised oscillations in the vortex ring, or toroidal vortex, that is each whorl of the UPA/subquark superstring.